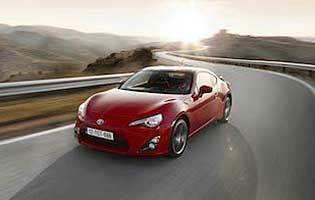 Needing something to fill the gap left by the Celica in the affordable sports coupe market, Toyota produced the GT86. Rear-wheel drive - unlike the front-drive Celica - and powered by a Subaru-sourced 'Boxer' flat-four cylinder petrol engine, the GT86 aims to engage keen drivers seeking a low-frills but engaging driving experience. In partnership with Subaru, with its own near identical BRZ, Toyota has what it hopes is not only a worthy successor to the popular Celica but a car capable of engaging with a new, younger generation of keen drivers. The joint venture between the two companies ensured plenty of technology and knowledge sharing, plus the bonus of Subaru of having its famous flat-four 2.0-litre petrol engine chosen as the sole power option. Unusually, turbocharging wasn't considered, meaning keen drivers are exposed to an 'old school' experience of being encouraged to use all the gears and all the revs. As such, the GT86 is very much for the purist; its firm ride, rear-drive bias and engine that demands to be worked hard won't suit drivers spoilt by turbocharging, safe front-drive handling characteristics and a plush ride. The upside is an experience that's only as good as the effort you put in, meaning it can be quite a rewarding one. If there are compromises they can be found in the GT86's cabin, as traditional Toyota values result in hard plastics and an ambience that doesn't quite march the car's price tag and performance credentials. Still, for a two-door sports coupe the GT86 is reasonably practical and offers enough cabin and boot space for owners willing to pack sensibly for weekends away. 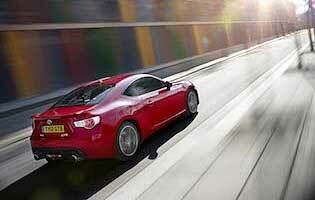 With its dramatic looks the GT86 promises much and, on the whole delivers. The rear-drive, front engine layout ensures an engaging experience but you'll need to work the engine hard to maximise it and the car's potential. While there are a few rough cosmetic edges in the cabin, with only front-drive models available from the competition, keen drivers will appreciate Toyota's enthusiasm for the affordable sports coupe market. Unless you're willing to drive the car with considerable constraint, the GT86 will burn a fair amount of fuel. Also, being a sports car, don't expect insurance to be especially cheap. That said, the car is based on proven technology so Toyota's usual reliability credentials apply. 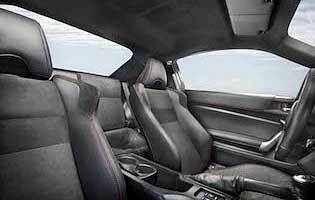 For a sports coupe the GT86's cabin is reasonably practical. Oddment space is, as you'd expect, a little limited but front seat occupants have good head, leg and elbowroom. The rear will accept two adults for short journeys but really they are best suited to children. The boot however is pretty generous for a car of this size. The car's conventional instruments are largely easy to read, while the major controls are straightforward. The weighty steering is matched by a short throw manual gearshift. Being a sports car, the GT86's front seats are of the figure-hugging variety and most welcome when you're cornering hard. On the flipside, the car's engine can prove intrusive thanks to its coarse exhaust note - not something that you want on the daily commute. Given the car's role in life, its firm ride is acceptable on rough urban streets. As you'd expect, an alarm and immobiliser is fitted as standard, as is keyless start. Although there is a significant glass pane in the tailgate a sturdy cover keeps any items within safely out of sight. Aside from the standard complement of airbags and ABS, the GT86's stability control system offers drivers a choice of modes, from fully on to a degree of slip that should please keen drivers. The rear-wheel drive, affordable and not too powerful sports coupe concept is that's been lacking in recent years, but the GT86 aims to fill the void with a 2.0-litre petrol engine that requires lots of work to extract its potential, and a set-up that's all too eager to deliver oversteer on demand. The Subaru-sourced engine can be gruff, the manual gearshift notchy and the ride overly firm, but the overall package can be entertaining in the right hands. More torque from the non-turbo engine would be appreciated to reduce driver effort but purists will delight in attempting to extract the maximum from this rough diamond. The GT86 could manage occasional family duties, but for daily use it would come up a little short on space as there's only one real spare seat and the hassle of getting in and out of the token rear seats would grate in time. Despite the GT86's on paper affordability, it's not really a car for the novice driver. Aside from being a quick car, visibility fore and aft isn't as good as a conventional hatchback. This could make parking tricky, although the cost of insurance will likely be of greater concern. Image-wise the GT86 is right up there with the best of the current sports coupe crop. Toyota's return to this segment has been largely greeted with a positive response from fans. The GT86's executive does display a few rough edges though, with a cabin populated by too much dark, hard plastic and a dull engine note taking the edge off an otherwise promising experience. With two long doors either side climbing aboard the GT86 isn't too much trouble, although it does sit low to the ground and so requires something of a drop down. Getting into the rear seats is also fairly straightforward, although the seats don't automatically return to their original position and there's not a lot of space back there. The standard audio system is relatively basic with a CD/tuner and auxiliary and USB inputs, and although it sits high up on the dashboard for good visibility it does have an aftermarket feel about it. Unlike many modern cars the GT86 does without steering-wheel mounted controls. Toyota's take on the classic two-door sports coupe looks best in striking, bold colours. Fans of the brand will be pleased to note it looks particularly good in white. On the inside the uniformly dark cabin is saved by flashes of bright trim. Being a sports coupe, the GT86 sits low to the ground, and while the view out is good, over the shoulder is less impressive thanks to the thick rear pillars and small rear screen. However it is still a relatively compact car, which should make parking and basic maneuvers straightforward with a bit of practice. Tyre repair kit fitted beneath the boot floor. Petrol engine options - 2.0-litre (197bhp). Transmission options: six-speed manual standard, six-speed automatic an option. Trim levels: no specific trim levels.